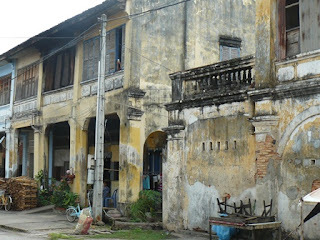 We wanted to explore Kampot a bit more so we headed off on foot towards the main market. It feels like there has been some growth and re-building going on in Kampot since we were here last year. That and we were also walking a completely different route. There are still many old colonial buildings in need ot repair and it is a shame that the new building is in ‘chinese wedding cake’ style rather than the more traditional French colonial. The markets haven’t changed, they are still hot, crowded, leaky and filthy. 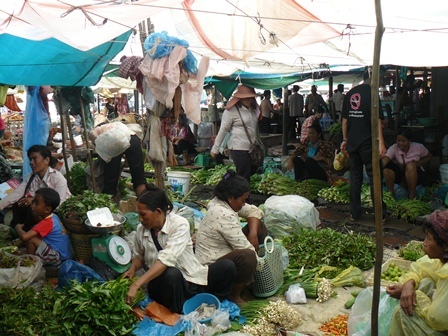 Sadly, the Kampot market are the worst we’ve been in in terms of appeal and cleanliness. In the fresh food markets you still have to wander over dirt floors that are, in reality many years worth of blood, guts & other crap rather than just dirty concrete like we have seen in so many other markets. Even in Nong Pet in Laos, the Hmong market had a concrete floor and a decent roof. 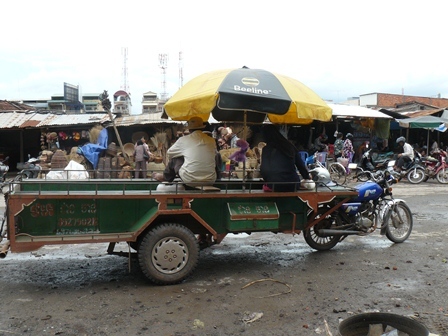 Transport vehicles here are different to the rest of Cambodia too, long versions of trailors pulled by motorbikes, little pushbike carts (not cyclos) but as always they are usually loaded well beyond what we might consider safe working loads. After the markets we headed back down along the river front and stopped for lunch at the Rikitikitavi. The rain had started and it was really quite pleasant looking out over the river. There is a sunset river cruise which left the riverfront at 4pm which we thought we might do. We headed back to the riverfront about 10 to 4 but the rain was setting in again, and the boat, the Diva, although bigger than others we saw was not exactly a big boat. 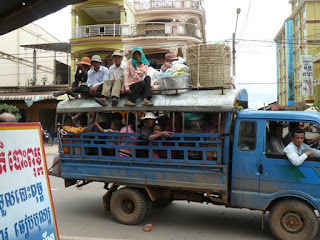 We decided against the trip – sunset unlikely, raining, river getting choppy in the wind and the thought of possibly another wet trip like on Tonle Sap just wasn’t that appealing. We decided to have a foot massage at Seeing Hands Blind Massage - $6 for 2 half hour massages – very very good indeed! It was still raining and not yet dinner time so we headed to the rusty Keyhole for a drink. Who should we run into but Scott & Mima (on a day trip from Kep) and Leighton, the pommie guy from yesterday’s bus. Several beers later, the rain had eased and we went in search of dinner. Ended up at the Bokor Lodge – I had fish amok and it was stunningly good. I don’t understand why people think Khmer food is not as good as Thai. Off to Kep tomorrow, so I hope this weather lifts, I really don’t fancy a week of todays weather.